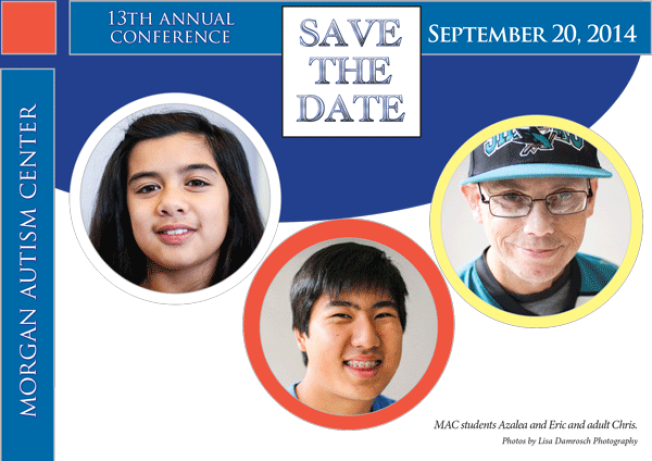 Save your spot for Morgan Autism Center's 13th Annual Conference! Hear from doctors and specialist from around the country touch on topics such as fostering positive parent-professional relationships, the latest in research, affordable housing, treatment strategies, and more. The all-day event will be Saturday, September 20th at Campbell Heritage Theatre. With more than 40 years of experience, Morgan Autism Center is the San Francisco Bay Area's leading provider of individualized educational services for people with autism. Chosen by more than 26 area school districts in Santa Clara, San Mateo, San Francisco and Alameda counties, Morgan Autism Center promotes an educational philosophy (Morgan Autism Center Model) that mines the best techniques from multiple developmental and educational models, and applies them to the individual needs of all students. The result is a nurturing, joyful environment that focuses on constant program optimization to deliver greater opportunities for student success.